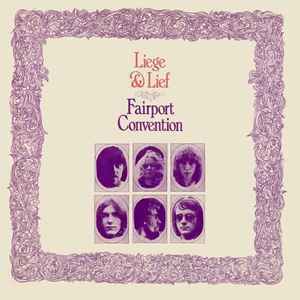 An acclaimed and seminal album in the advancement of British 'Folk-Rock', "Liege & Lief" is the fourth album by Fairport Convention. Released in the UK on Island Records in December 1969 and supported by a sell-out concert at London's Royal Festival Hall, it resided in the UK's album charts for 15 weeks. Prior to recording, the band suffered the tragic loss of drummer Martin Lamble and Richard Thompson's girlfriend, Jeannie Franklyn, when their tour-bus crashed. In addition, Iain Matthews left, later to create "Matthews' Southern Comfort". The band regrouped and began rehearsals in a country house in Winchester, with Dave Mattacks filling Lamble's role and with violin virtuoso Dave Swarbrick joining the band full time, both of whom had appeared on the group's previous release, "Unhalfbricking". The band was completed by Richard Thompson & Simon Nicol on guitar, Ashley Hutchings on Bass Guitar and Sandy Denny on vocals. The producer was Joe Boyd, with engineering by John Wood at Sound Techniques, London. Members Hutchings and Denny had departed the band by the time this was released in the USA. Released in gatefold sleeves. First issue sleeves, containing the pink Island label with the white 'i' logo, are 'lighter' in tone than the reissue. The reissue, containing the palm tree label, has a 'darker purple' appearance - released around the time of the USA issue, which has a similar 'delicacy' to the print as the early UK sleeve. The images at the foot here may assist: Print Comparison. My LP matches the first issue ILPS 9115, (https://www.discogs.com/Fairport-Convention-Liege-Lief/release/2024570) in every respect, except that the label shows the catalog number as ILPS 9115 A and ILPS 9115 B, does not have the witch logo or the names of the publishers. Excellent reissue of a fantastic album. Sounds really good. Recommended. Very good quality vinyl. Highly recommended. Just received today from States. Clean sound with very good bass. Superb reissue - couldn't really be better. The remaster sounds really nice and the pressing is very clean. A beautiful album. However this pressing leaves much to be desired. The cover is cheap, the innersleeve is that horrid white paper that will scratch the LP upon removal or reinsertion- so must be replaced immediately. After cleaning, still I noticed excessive surface noise throughout. No info on what was used to cut the master, but I suspect it was the same digital file used to cut the CD as highes seem a bit shrill and the overall sound seems a bit compressed. A disappointing product overall. If you get a dud-- please return it-- it's the only way the labels will ever learn to stop churning out crap and calling it a "premium product". I have the same thing, folks. Can't find out much more about this version, but I'm glad to hear we're all in the same boat i.e. my copy doesn't appear to be a mix 'n match. Loving this group! My US copy has a gatefold cover with the brown A&M label but unlike this one, under the tracks at bottom center, it has, "Produced by Joe Boyd for WITCHSEASON PRODUCTIONS". Hi did you read my question about the records ? Original first uk ?